How do you get Spider Veins/Varicose Veins? Spider veins and varicose veins of the legs are an embarrassing and sometimes painful condition. They affect millions of men and women alike and their development is influenced by many factors including heredity, pregnancy, activity, and underlying medical conditions. 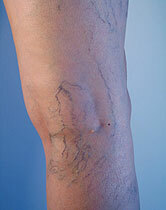 Varicose veins are raised, thick and ropey vessels. They occur when the larger blood vessels in the lower legs become stretched out and fail to effectively return blood to the heart. Varicose veins should be evaluated and treated by a specialist such as a vascular surgeon. Spider veins occur in smaller vessels closer to the surface of the skin. They can appear singly, or have a branched or webbed appearance. These vessels may be affectively treated in our office with sclerotherapy or laser therapy. Sclerotherapy is a procedure in which a salt solution, known as a sclerosing agent, is injected directly into the vessel being treated. The lining of the vessel becomes irritated, leading to a closing off of the vein. After permanent scarred closure, the body eventually absorbs the vessel. The sclerosing solution is injected with a very fine needle, smaller than the vessel itself, so the procedure involves minimal discomfort. What is the Sclerotherapy Recovery Time? Recovery times and Sclerotherapy results will vary depending on the size and number of vessels, and how easily they are visualized. Most patients see will see significant improvement within 3 months of treatments. Patients are encouraged to wear compression stockings for a few weeks after sclerotherapy to optimize results. A “touch up” session is always performed two months after the intial injection. Results will vary depending on the size and number of vessels, and how easily they are visualized. Laser therapy may also be performed on spider veins using the Vbeam pulsed-dye laser. It is best for very fine vessels that cannot be injected with a needle. Lasers are often used to complement treatment with sclerotherapy. For more information on the treatment of spider veins/varicose veins schedule an appointment by calling us today!